Smoke fresh pineapple juice with the PolyScience Smoking Gun. Cover for 15 minutes. Combine- Nigori Sake, smoked pineapple, yuzu juice, ginger syrup. Freeze with ice cream machine. 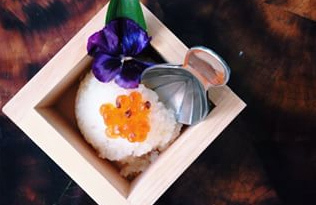 Scoop into cedar sake box, top with salmon caviar, smoked sea salt, and mist with laphroaig quarter cask. Garnish with pineapple leaf and micro orchids. The snow cone can also be made-to-order using liquid nitrogen to freeze cocktail mixture instead of the ice cream machine.